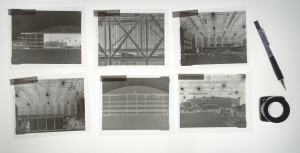 You still need 4×5 negatives like these for HABS/HAER. These are in temporary negative sleeves. HABS/HAER documentation projects still need to be photographed with large format film, but the National Park Service has made a step towards digital methods. (The formal name of this method of documentation is Historic American Building Survey/Historic American Engineering Record/Historic American Landscapes Survey: HABS/HAER/HALS.) Here is a link with the new procedures for transmitting HABS/HAER documentation of historic structures to the collections at the Library of Congress. I expect these standards will carry over to the state standards for “Level I” documentation of historic structures. For more on HABS/HAER please check out my page on that topic. For photographers, the big change is that traditional (wet processed) contact prints are no longer required; you can scan the negatives, and submit digital prints made from the scans, if the scans include the borders of the negative. According to the guidlines, “The print must be on fiber-based digital printing paper, without brighteners, and printed using carbon or pigment inks. The printer/paper/ink combination used to produce the digital print must be rated by an independent rating organization to have a permanency of at least 150 years.” The best known independent rating organization is Wilhelm Imaging Resources. Since most of my clients already need scans of the negatives for their own purposes, the option to digitally print the proof prints will probably save some money compared to the wet print option. However, the original photography still has to be done on film.